Tying steel reinforcing bars has always been tough, manual labor, as reinforcing ironworkers spend much of the day hunched over tying rebar. 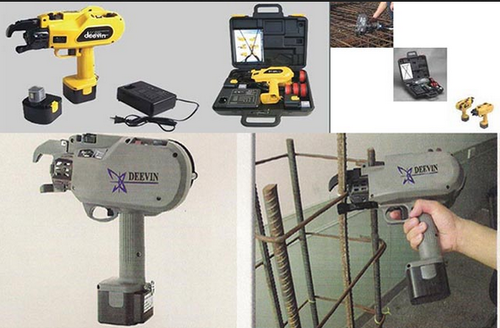 Deevins's Rebar tying machine is fully automatic machine to ie rebar. The machine holds the crossed reinforcing bars, feed the tie wire, winds, cuts, and tie in one second. The reseult is a strong, single strand, double wrap tie. The Automatic Rebar Tying Machine can be used in numerous applications, manholes even in remote areas where the electricity is not available. Advantages of the Rebar Tying Machine include saving time through productivity it is 6-6 times faster then hand tying, reduction of on-the-job injuries, consistent results, and reduction of material cost by decreasing wire consumption and save big money and manpower.